Comfort: Carpet provides a soft, cozy feel that hard surface cannot. It just feels good under your feet. Safety: If you have small children, carpet provides a cushion for the fall. If you have ageing pets, they won’t slip or be anxious to climb them. Cost: Wood or tile steps are an investment, to the tune of $200-$300 per step factoring in the custom labor to tear off your existing box and to “rebuild.” If you add a carpet runner after the fact, the cost increases. Patterns installed the full width of the skirt board look like a carpet runner, without the expense. Style: With so many interesting styles to choose from, it is fun selecting the design that fits your taste. If you’re bold, select a strong geometric. If your style is more tailored and simple, choose a subtle texture, but make sure it has “depth” so that it looks more like a “rug” and not basic carpeting. – You can create a custom area rug in the same pattern or texture for your foyer or an adjacent room. This creates more of an “impact” and relates this space to the stairs. 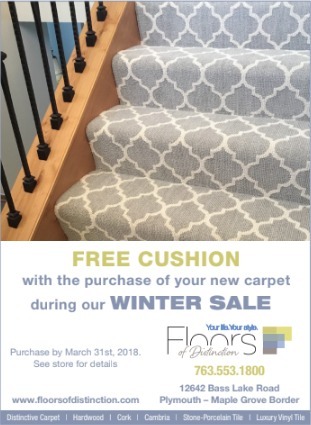 – If you want to separate your steps from your upper level hallway carpeting, add a wood stair nose that matches either your wood railing or skirt board. This way, the last riser is separated from your existing carpet and you won’t have that unsightly carpet to carpet transition. – Remember, your steps are a separate entity. They are often overlooked for design possibilities and could use some pizzazz!